Galeon show another project involving the 420, 430 series this time with the Skydeck version. A flybridge motor cruiser in all senses, accept for the fact that its aft deck and flybridge of the new 430 Skydeck all have a young generation call to them. First of all the aft deck features the modular modifiable layout as the 430 HTC, while the flybridge will feature three forward facing seats one central for the helm, and two sun pads. Inside the layout of the 430 Skydeck features the clever three cabins two heads lower deck, and a living main with a galley to port side opposite the helm. 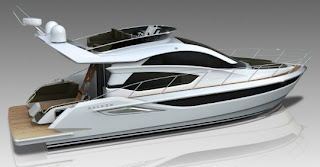 Interesting and also very clever how Galeon and designer Tony Castro made all the three models; 420 Fly, 430 HTC, and this latest 430 Slydeck with distinctive window patterns, that is all being different.